LONDON - The United States has a long tradition of arming its allies to advance Washington’s foreign policy. In 1940, President Franklin D. Roosevelt called the U.S. the “arsenal of democracy” as he pledged thousands of ships, tanks and warplanes to countries battling Nazi Germany. Policymakers settle on one method or a mix of both after weighing the benefits and risks to U.S. interests and the recipient’s own preference. Both approaches have advantages and disadvantages. Both are being used now in the Middle East. First, sending U.S.-made weapons helps American manufacturers’ bottom lines. “Made in the USA” equipment also tends to be popular among U.S. allies because in many cases it is deadlier than Russian-produced hardware. But it is usually more complex and thus harder to use. And any time Washington gives its allies U.S.-made military hardware, there’s a chance the enemy could get its hands on the stuff. This is not only politically embarrassing; it potentially betrays the Pentagon’s technological secrets. The equipment the Iraqi Army abandoned in mid-2014 included at least one M-1 tank, hundreds of which the U.S. has sold to Iraq in recent years. The $4-million M-1 is viewed as the best tank in the world because of its tough armor, powerful main gun and high-tech sensors. It is one of the U.S. Army’s main advantages over rival armies. It was bad enough that Islamic State snagged one or more M-1s among other U.S. weapons. U.S. officials expressed further alarm when, in late January, a video posted to YouTube depicted the Hezbollah Brigades, an Iraqi Shiite militia heavily backed by Iran, rolling into battle against Islamic State in a convoy that included at least one M-1. It’s unclear how the Hezbollah Brigades, which Washington has labeled a terrorist group, acquired the M-1. But according to the Long War Journal, which first drew wide attention to the YouTube clip, it’s possible the Shiite fighters recaptured the tank from Islamic State. If that’s true, then that key U.S. weapon is now in the arsenal of not one but two armed groups that Washington opposes, one of which enjoys strong ties to the regime in Tehran, with which the U.S. is also at odds. The Pentagon has not proposed to cut off supplies of U.S.-made weaponry to Iraq, despite the tendency of these weapons to wind up in the arsenals of U.S. enemies. The Pentagon has spent $20 billion since 2003 training and equipping Iraqi forces to be more like U.S. forces — and isn’t about to declare that investment a total loss and start over. For decades, the U.S. backed the Kurds of northern Iraq in their wars of independence against Baghdad. In 1992, with U.S. warplanes flying top cover, the Kurds succeeded in establishing a mostly autonomous region inside Iraq. But the peshmerga are a lightly armed militia equipped mostly with Cold War-vintage Russian weapons that they stole from the old Iraqi Army or acquired on the black market. While brave and well-led, the Kurds have found themselves outgunned in battles with Islamic State. 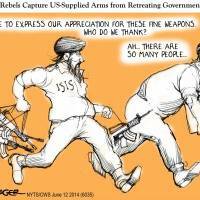 In any event, the U.S. had to acquire the Russian weaponry before it could donate it to the Kurds. When direct provision of expensive U.S.-made weaponry is prohibited or impractical, sending Russian arms through a third party is Washington’s other way of arming an ally. Now, we don’t know for sure where the peshmerga’s extra weapons came from before the Air Force dropped them in Kurdish territory, starting in August. 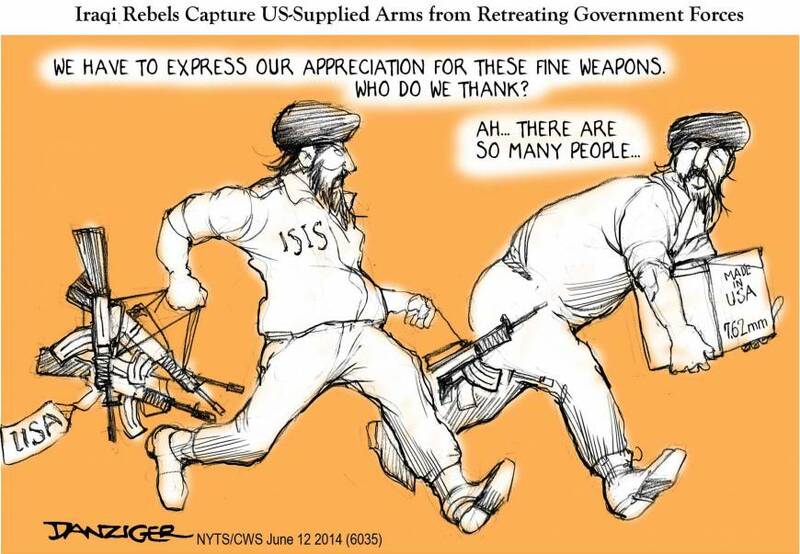 It’s possible U.S. advisers in Iraq got the arms from old Iraqi warehouses. There have been discussions between Washington and Baghdad about the U.S. “backfilling” any equipment that Iraq donates to the Kurds. David Axe, an American military correspondent who writes on military life and aspects of current conflicts, is the national security editor at Medium.com. The opinions expressed here are his own.